Nowadays, drones are found nearly everywhere: Farms, fields, even underwater. They could soon be found on the decks of a new kind of aircraft carrier combing the vast oceans for valuable intel. The US Navy has long wanted to line smaller ships like frigates and destroyers with drones that could buzz around the open seas, sending surveillance and recon data back to onboard intel gatherers. And yesterday, DARPA announced a new program that could just do that—and “deliver embedded capabilities that have been on the US Navy’s wish list since World War II,” the press release says. DARPA’s unveiling a program called Tern—a collaboration between the agency and the US Navy’s Office of Naval Research. DARPA just awarded Phase III funding to a team led by Northrop Grumman, the security company that’s of the heaviest hitters in the badass aircraft department. That means that DARPA will oversee the construction of a full-scale prototype like nothing we’ve ever seen before. 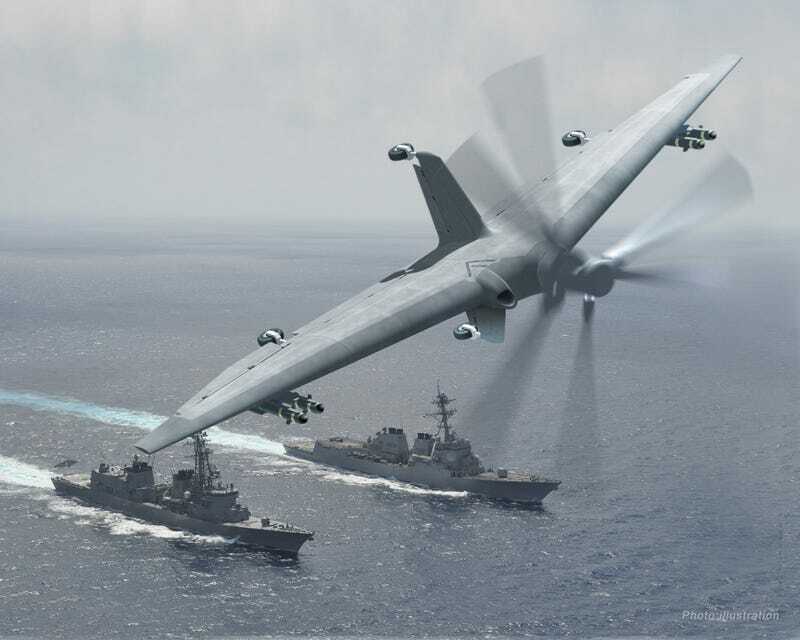 The new design for Phase III should look a little something like this: two propellers on a flying-wing UAV’s nose would lift it from the ship’s deck like a chopper but then propel it horizontally like a plane. The drones would be fit inside the ship when they’re not being used for sea-skimming missions. Traditionally, it’s been hard for those little UAVs to safely take off and land on rocky waters onto boats that are smaller than nice, big aircraft carriers. But the engineers want to make a drone that could take off and land in cramped, bumpy quarters and can fly for a long period of time. The Navy’s long-standing dream of using small, unmanned aircraft seems to be coming true. The new frontier also marks yet another entry to the unrelentingly growing list of uses for drones, drones that can go anywhere in the world with frightening ease.